A Receipt represents money that has entered one of your bank accounts, or at least has been received for banking at a later time. The new transaction window will open. The customer’s name will automatically appear in the From field. MoneyWorks will have inserted a number one greater than the previously used one. If this is correct, you need not type anything in. If you want, your receipt numbers can be prefixed by non-numeric characters. When MoneyWorks inserts the next receipt number for you, the non-numeric characters (and any leading zeros) will be prepended to the number. For example: If you previously entered “CR00405”, MoneyWorks will enter “CR00406” for you in the next Receipt transaction. By default, this will contain today’s date or the last date used. Click the pin to set the default bank account. The pop-up menu will be displaying the default bank account for the transaction type. Set the pin next to the bank menu to change the default. Note: If you accumulate receipts for subsequent banking, you should use a bank holding accounting for the receipt. When you finally come to bank the money, use the Banking command. You can enter up to 200 characters into this field. Entering a customer code into the Customer field, automatically fills out the From field. If the payer details do not fit on a single line, or you want to enter address details, click the address disclosure control to show the full mail and delivery addresses — see Viewing the Address Fields. You can enter up to 1000 characters into this field—press Ctrl-downarrow/⌘-downarrow to see the full description field. The OK and Next buttons dim when an amount is entered into the Amount field. The transaction is not complete until you have allocated the amount to one or more accounts. 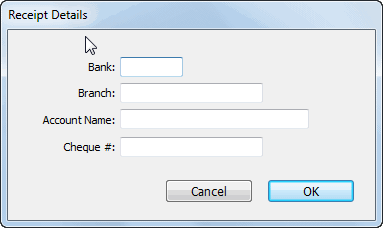 Setting this determines how the transaction will be printed on the deposit slip in the banking command. “Cash” transactions are aggregated as a single figure. Other transactions are listed individually. Click the down arrow next to the Paid By menu. If the Paid By pop-up menu is itself highlighted, you can press Ctrl-downarrow/⌘-downarrow. The Receipt Details screen will be displayed—the details of this depend on whether you are processing a credit card or another form of payment. Enter the receipt details—you only need to do this if they differ from those displayed next to the customer code (i.e. on the customer record). Additional fields can be displayed using the Views toolbar button. 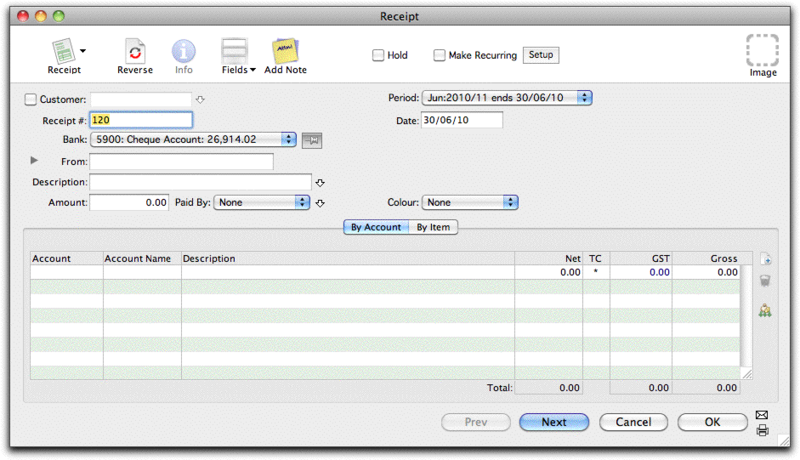 The total Amount of the Receipt needs to be allocated to one or more accounts before the transaction can be entered. Note that the OK and Next buttons remain dimmed until the total gross amount and the total of the detail lines balance. the print and post options. Click the OK button if this is the last payment to be entered. 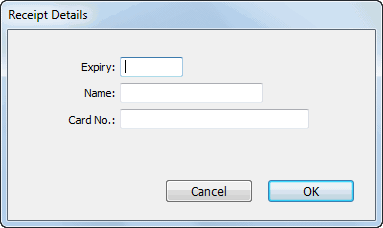 Clicking Cancel discards the transaction.